Ian Curtis died on this day in 1980. Though Ian is gone, his music and memory -- not to mention his impact on music and culture -- will never be forgotten. His influence remains undeniable; his light continues to shine through recordings of his brilliant music and intense energetic live performances. 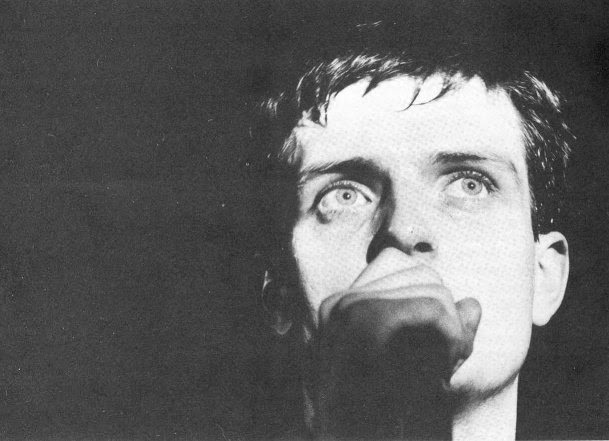 Keep Ian in your thoughts today and enjoy some music and discussion about the legendary Ian Curtis and Joy Division. Curtis' life was featured on the BBC program Great Lives in 2008. Host Matthew Parris, British poet Simon Armitage and Peter Hook discussed Curtis' life, musical impact, and his final days. During the show, Hook played a short snippet of an unreleased version of Ian Curtis singing "Love Will Tear Us Apart" recorded by Malcolm McLaren. Stream the episode of Great Lives below - more info on the episode is posted here. Curtis took his own life the day before Joy Division were scheduled to leave England to come to America for their first tour. The full Joy Division North American tour itinerary isn't officially available to view, however this website attempted to piece the tour together using Rob Gretton's notes, club ads, and other scraps of info. FYI, there was a Detroit date scheduled for May 26th at Bookies. A short documentary from 1987 featuring Bernard Sumner, Peter Hook, Stephen Morris, Tony Wilson, Rob Gretton, and Alan Erasmus talking about Ian Curtis and Joy Division. There's also a few comments made about the commercialization of Curtis' death. An excellent documentary on Joy Division simply titled Joy Division was released in 2007. The film includes interviews with Curtis' band members as well as key players like Peter Saville, Anton Corbijn, and Tony Wilson, among others. The full documentary has been pulled from You Tube but it is available to view on Netflix.